(Nanowerk News) For decades, researchers have been working to develop nanoparticles that deliver cancer drugs directly to tumors, minimizing the toxic side effects of chemotherapy. However, even with the best of these nanoparticles, only about 1 percent of the drug typically reaches its intended target. Now, a team of researchers from MIT, the Sanford-Burnham Medical Research Institute and the University of California at San Diego have designed a new type of delivery system in which a first wave of nanoparticles homes in on the tumor, then calls in a much larger second wave that dispenses the cancer drug. 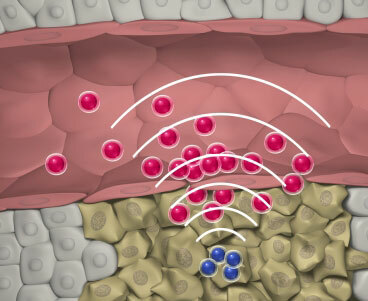 This communication between nanoparticles, enabled by the body's own biochemistry, boosted drug delivery to tumors by more than 40-fold in a mouse study. "What we've demonstrated is that nanoparticles can be engineered to do things like communicate with each other in the body, and that these capabilities can improve the efficiency with which they find and treat diseases like cancer," von Maltzahn says. Senior author of the paper is Sangeeta Bhatia, the John and Dorothy Wilson Professor of Health Sciences and Technology and Electrical Engineering and Computer Science and a member of MIT's David H. Koch Institute for Integrative Cancer Research. "There are beautiful examples throughout biology where at a system scale, complex behaviors emerge as a result of interaction, cooperation and communication between simple individual components," von Maltzahn says. The MIT team's approach is based on the blood coagulation cascade — a series of reactions that starts when the body detects injury to a blood vessel. Proteins in the blood known as clotting factors interact in a complex chain of steps to form strands of fibrin, which help seal the injury site and prevent blood loss. Jeffrey Brinker, professor of chemical engineering at the University of New Mexico, says the new strategy is a clever way to improve drug delivery to tumor sites. "Instead of targeting the tumor itself, it's targeting a microenvironment that they've created," he says. "By developing these nanosystems in a two-step approach, that could be used in combination with a lot of other strategies."